In our research on the environmental effects of particulate matter from ship emissions at OPRI, we have garnered useful and valuable data by conducting scientific surveys and making analyses using both on-site observational data and quantitative simulations. At the same time, we have carried on information exchanges with scientists abroad in order to better understand regional differences. Through these activities regarding particulate matter from ship emissions, we learned of the extremely large effects of secondary particles created by the particulation of nitrogen oxide matter (NOx), sulfur oxide matter (SOx),etc., emitted as gases into the atmosphere and undergoing photochemical reactions; we subsequently gained international recognition and understanding for our observation that reducing the sulfur content in fuel has an indirect effect on reducing the impact on the environment. In future, we have hopes that as the establishment of regulated ocean areas proceeds, it will contribute to great improvement in the heretofore unregulated area of PM from ships. Regarding greenhouse gases (GHG) from the international maritime transport sector, while discussion at IMO is currently being taken on individual ships' management, we believe that much larger scaled efforts will be needed to make a significant reduction. These measures should include the continuous monitoring and reporting of total GHG emissions through IMO to the United Nations Framework Convention on Climate Change (UNFCCC) as well as the monitoring of individual and averaged efficiency improvements. To achieve this, OPRF is proposing to international society a program that would include a framework for the accurate and reliable reporting of the total GHG emissions by the international maritime sector. We are also studying ways to promote market based instruments for GHG reduction, especially to establish a new framework to create emission credit from international ship operations. We are taking every opportunity to explain these proposals to experts from the IMO, EU, OECD and other interested organizations, in the hopes of contributing to the most appropriate promotion of measures for the reduction of GHG emissions from the international maritime sector. The International Maritime Organization (IMO) has recognized the importance of controlling the invasion of aquatic organisms to other ocean areas due to ship activities and has started to establish a new international framework to reduce bio-invasion risks through hull-fouling organisms. This framework will have a significant influence not only on anti-fouling paint technology but also on other ship operations, such as the dry docking cycle and in-water cleaning. This project aims to establish a future framework for minimizing total risks from bio-fouling and to make proposals to the international community. The framework is not simply a combination of traditional technology, but a comprehensive package of anti-fouling systems and cleaning systems, including debris recovery and total risk assessment. OPRF has already taken actions to promote the framework, having made presentations and proposals to relevant international meetings and conferences, including discussions at the IMO and the International Paint and Printing Ink Council (IPPIC). Since the beginning of the 21st century, the world has faced the challenges of globalization, an increasingly multi-polar world economy, diversifying values, and serious problems with the global environment. To address these major challenges, the maritime societies of Japan and the world must give serious thought to what actions should be taken toward the middle of the 21st century. Beginning with awareness of these problems, we have conducted studies from a long-term perspective, with our sights set on the year 2050. These have culminated in two proposals for the world and five proposals for Japan. Our proposals for the world call for safety and environmental countermeasures (including global warming measures) and can be found in our publication "Maritime Society in the Era of Global Warming - A Message from the Year 2050." The five proposals for Japan, including global warming countermeasures and greater international competitiveness on the Asian stage, are published as "Maritime Industries Alive in Asia - A Message from Japan in the Year 2050." 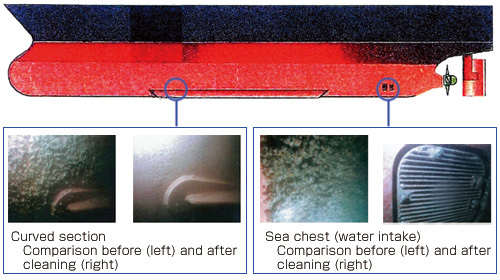 In the early 1990's, the environmental impacts of exhaust gas from ships (e.g., acid rain) began to draw attention. At OPRF, we estimated emissions of nitrogen oxides (NOx) and sulfur oxides (SOx) from ships and also researched measures to reduce them. 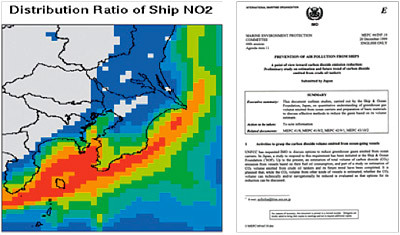 Moreover, we have surveyed and analyzed the environmental impacts of VOC (volatile organic compounds) and PM (particulate matter) emitted from ships, in terms of both field measurements and numerical simulations, thereby making significant contributions in the establishment of international regulations for these air pollutants. Also, since the adoption of the Kyoto Protocol of the United Nations Framework Convention on Climate Change (UNFCCC) in 1997, there has been discussion in the International Maritime Organization (IMO) on regulating emissions of greenhouse gases (GHG) from the international operation of ships. At OPRF, while continuing independent activities (such as our pioneering announcement of estimations for GHG emissions from ocean-going vessels in 2000), we have also participated in joint research with overseas research institutions and are playing a leading role at the international level. Innovations in Production Systems -- "Shipbuilding CIM (Computer Integrated Manufacturing)" and "ZoHaku Web"
In order for Japan's shipbuilding industry to reinforce its international competitiveness, OPRF, along with leading companies, began development of CIM for the shipbuilding industry. 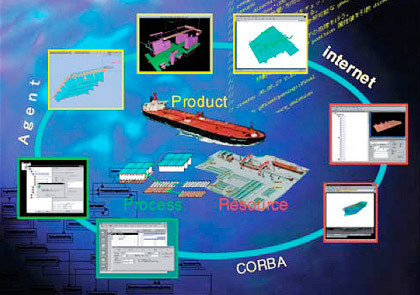 This system can express on the computer the full range of ship-building information, from design of ships to their construction, enabling information sharing and thus dramatically enhancing production efficiency. We carried out the research and development over a ten-year period from 1989 and successfully constructed a product model. The fruits of this innovation are now used in the automatization of shipyards and in the systematization of production sites. Subsequently, OPRF began to develop a tool which supports information exchange over the internet between shipyards and marine equipment suppliers. 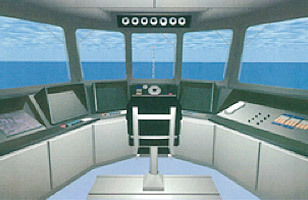 The outcome of this R&D was the establishment of the ZoHaku Web company in 2001, with the participation of 20 shipbuilding companies and about 70 ship machinery companies. Amidst the long-protracted recession in the maritime shipping sector, Japan was able to maintain a nearly 50% share of the world's shipbuilding volume in the 1980s. 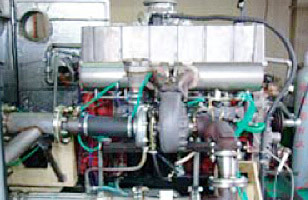 However, Japan trailed behind overseas rivals in engine development. In response, OPRF had the vision of inspiring young engineers in the recession-bound shipbuilding sector to new hopes and dreams with the development of a screw propeller-less ship of the future, aided by leading-edge superconductivity technology. The project that arose from this was the Yamato-1, a ship using super-conducting magnets to generate propulsion. The greatest challenge in the ship's development was to make a propulsion system incorporating super-conducting magnets of sufficient size and yet light in weight. The efforts of researchers and scientists in their pursuit of high performance super-conducting magnets came to fruition when the Yamato-1 was launched for her first test voyage in 1992. This world-first development of a super-conducting propulsion ship opened up new avenues for the application of super-conducting magnet technology and yielded a rich harvest of technical results. In the aftermath of worldwide marine pollutions caused by maritime accidents involving tankers, OPRF has actively played a great role to prevent pollution through experimentation at OPRF's Tsukuba Institute by installing a test water tank uniquely capable of using oil. In the 1980s many models of new oil fence and oil recovery equipment were tested and developed. Moreover, OPRF went far in experimentation concerning the preventive structures against tankers' oil spill like the double hull and mid deck. Besides these contributions, valuable data related to dispersion, drift and weathering of spilled oil in the wind and waves and in the current were highly evaluated not only at home but also internationally. Those data are utilized for actual oil spill response. 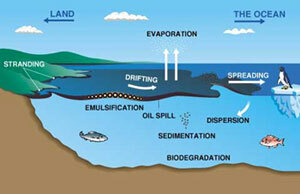 The Spreading, Drifting, and Weathering of Crude Oil on the Open Seas. 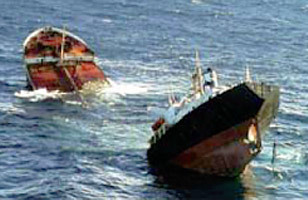 The fuel oil spill accident of 1997 caused by the Russian tanker Nakhodka in the Sea of Japan resulted in a major marine pollution disaster. OPRF had long expected that such accidents might happen and began to implement, in 1991, a research project on the "Development of Technology and Materials for the Early Prevention of Large-scale Marine Oil Spillage Accidents." It developed methods for predicting the spread, drift and weathering of oil spills as well as techniques for controlling, collecting and recovering the oil spilt at sea. OPRF built a special "Circulating Water Tank" at its Tsukuba Institute for experimental studies on the weathering behavior of crude oils (evaporation, emulsification and changes in properties), in view of the critical importance of making some findings for the initial measures to combat oil spills. The results of these studies were analyzed and made public in a paper titled "Weathering of Crude Oil Spilled on Water." After this, the Petroleum Association of Japan carried out similar weathering experiments on a total of 27 types of crude and fuel oils. The results were made available on CD-ROM. OPRF analyzed the results in the same manner as before to enhance their usefulness. The findings have been published under the title of "Analysis of Weathering Test Results of Crude Oils Using a Two-Component Model." Furthermore, OPRF also held an international symposium titled the "Marine Oil Spill Response," bringing together both domestic and international technical experts who were involved in the large-scale oil spills of ships such as the Nakhodka and the Exxon Valdez. 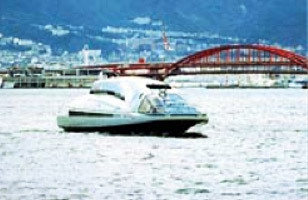 At the "Third Conference of the Parties to the United Nations Framework Convention on Climate Change" (COP3) held in Kyoto in December of 1997, while a general agreement was reached between countries on target reductions of CO2 emissions, the investigation of the special conditions involved in the reduction of CO2 incidence from ocean-going vessels (the difficulty of regulating vessels at sea, specific vessel operation systems such as flag of convenience etc.) were requested of the International Maritime Organization (IMO). For this reason, this research project is designed to comprehensively investigate the emission volume of greenhouse gases such as CO2, methane (CH4) and nitrogen monoxide (NO) from ocean-going ships and the options available for the reduction of such emissions from a technical, socio-economical and policy forming viewpoint. The results of this research are being gathered as fundamental data to be utilized in the reduction of greenhouse gas emissions such as CO2 on a global scale. They are used in the formation of policy proposals presented to IMO and are dispersed amongst the related organizations and individuals worldwide. 1.Proposal to the 47th Session of the Marine Environmental Protection Committee (MEPC 47) titled "Prevention of Air Pollution from Ships: Study on Estimation and Reduction of GHG Emissions from Ocean-Going Vessels"
Carbon dioxide is the most prominent greenhouse gas responsible for global warming, and nitrogen and sulfur oxides (NOx and SOx) are known to cause acid rain and photochemical smog. To reduce these combustion-related pollutants and suspended particulate matter, work is in progress to develop a ceramic engine system using natural gas (NG). This research project is unique in the world and promises clean combustion at high efficiency. Using a catalytic NG reforming unit and a CO2 separator, this revolutionary engine system boasts a thermal efficiency better than 70% and a dramatic emission reduction, with CO2 emissions reduced to less than a third of their present level, and NOx and SOx cut to almost zero. The International Maritime Organization (IMO) has adopted a resolution to reduce the pollution-causing NOx emissions from ships to less than 70% of their present level. The impact of exhaust gases is particularly serious in coastal areas, where they are responsible for direct environmental pollution. 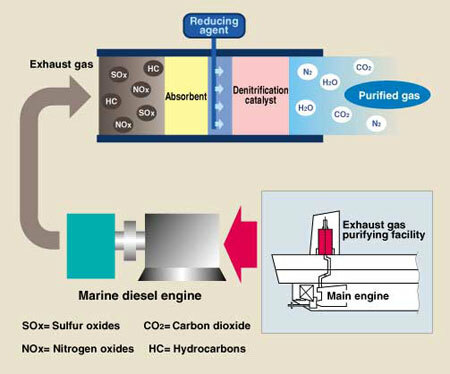 Confronting this issue, research is underway to develop a new high-performance denitrification catalyst for cleaning exhaust gases from diesel engines in small-sized coastal vessels, while the development of a new catalytic nitrogen removing system that will operate efficiently at low gas temperatures when leaving ports is also being implemented. Moving toward the achievement of a modern coastal ship where work on board the ship is dramatically reduced and ideal working conditions can be realized, OPRF made a life-size model of a coastal ship with a one-man-operated wheelhouse and crew space and put it on display to the interest of all from around Japan concerned in maritime activities. In addition, a coastal steel products carrier with a gross tonnage of 497 tons fitted with revolutionary equipment such as a one-man-operated integrated ship-operation system, comfortable housing accommodations, a modular engine room, auxiliary propulsion functions such as a bow thruster (a propulsion device built into the ship's bow) was set sail. This led to the assessment of the benefits of the modernization of coastal ships. As a solution to global warming and also a measure to reduce harmful exhaust gases, fuel conversion to natural gas from petroleum is expected. Since fiscal year 1998, OPRF has been engaged in the research and development of a highly efficient and totally new natural gas engine system, as a counter measure to exhaust emission. In this development, which is a world first, the engine uses reformed gas and hydrogen and carbon monoxide generated by reforming raw natural gas through high temperature exhaust gas and a catalyst. Edging closer to practical use, OPRF hopes this epoch-making engine system will be one way of solving global environmental problems.